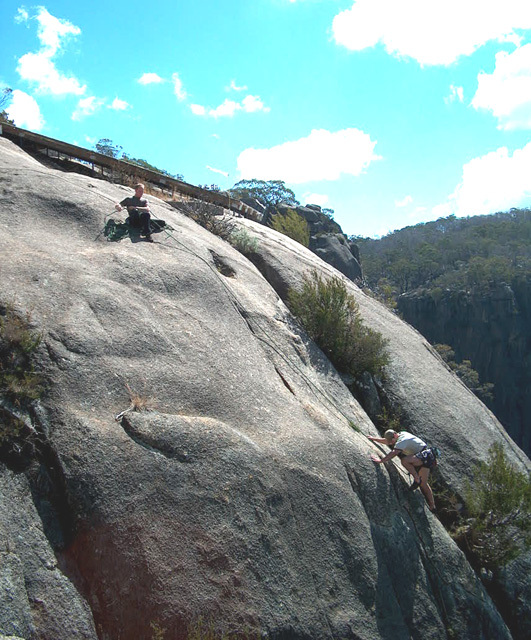 Chockstone Trip Report: Mt Arapiles, June 2003. Months in the planning, emails flying back and forth, plans hatches, changed, confirmed, money paid to the Keeper Of The Keys at that most superlative oasis, Lake Catani, and then finally, the day arrived; a Friday before the long weekend. Cruelly time slowed until work was at long last completed, the boot crammed with all manner of gear and our little band of explorers off into the tamed wilderness to taste the fruits of paradise once more, shrug off the shackles of modern society and draw close to the granite heart of that loved realm we call Mt Buffalo! Right: Michael leading Maharajah (17), The Cathedral. 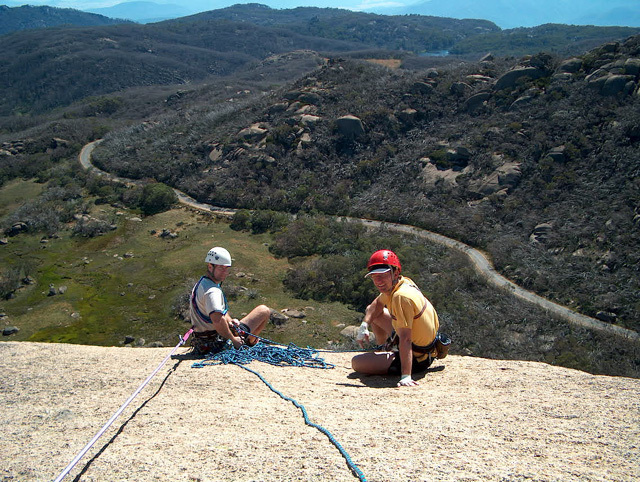 Below Left: Belaying a top same. Our team consisted of my wife and I, Brad, and Owen who'd sallied forth from across the seas (okay, Bass Strait), and who was indeed the instigator of this most marvellous occasion. While Melissa partook of the lakeside serenity, "the boys" attacked Saturday morning with gusto, heading for The Cathedral at rally speeds in Owen's rented Lancer, the weight of two racks theoretically holding us into the hairpin corners while tourists in Mercedes convertibles hugged the shrubbery. A sprightly approach found us at the base, where-in I stole the first lead of the trip, to take us up Maharajah (17) in one long combined pitch. Avoiding the three star flake start I opted for the trench variant deploying the two biggest cams and thus removing considerable tonnage from my oft over primed rack. The siren call of "booty!" forewarned my entry into the duel cracks above. A HB quadcam gleamed like an elusive trout from beneath the waters. Leaving the fishing to others I clipped and attempted the crux, laying into the barn-door crack and trying to tuck in and gain an obvious horizontal just out of reach above. Unfortunately my sense of self preservation (ie. gutlessness), forced me to try and place gear before committing to the move, and thus the dogs where well and truly let out. (Sigh). A second stab had both the gear in and the hold obtained, with one more move landing me atop said edge for a solid stance. Leaning left, the alternate crack was gained and some funky moves and good pro later I'd tagged the massive "thank-god" jug marking the top of the belay ledge. Considering the drag at this point minor, I opted to continue finishing off the last few fun meters with relish, until the final run-out slab top-out where-in the drag caught up with a vengeance. Posed in a ridiculous position, like a frog trying to leap in 10 times gravity I stained at my tethers pleading for "slack" and pondering the semi-loose block I'd slung 3 metres below. Crab walking rightwards across the delicate smears I managed to release the line from it's pinched entanglement and shot forwards towards the bright shinny new chains of wholeness and wellbeing with considerable zeal. Ah, what a climb! Exciting until the very end. With the wind roaring across the plateau, the others came up, (each failing to reel in the slippery fixed catch below) and we rapped back down to consider our next move. "One more route before lunch" was the verdict, and Sultan (20) the layback crack summiting the same block our chosen objective. Owen racked up and lead out, the route having been on his "to do" list for years, but the challenge thus far avoided due to the wild nature of the climbing. 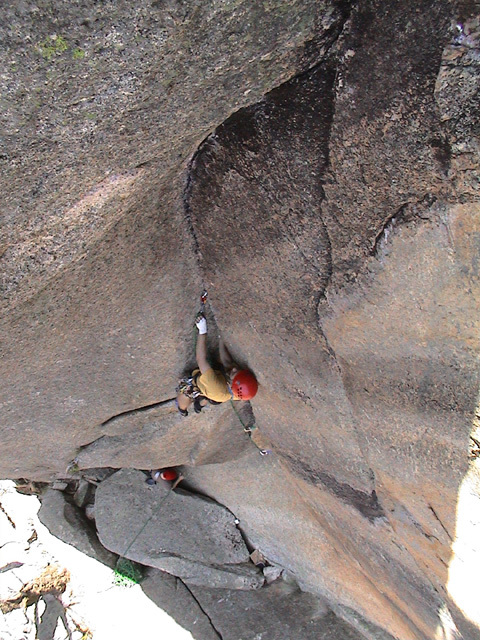 True to form he styled it, with a casual reply to my alarmed warning about a popped nut he'd placed mid-crux on the first mini-roof, and a calm decision to skip the only bolt on P1, at the second mini-roof, where-in big natural pro sufficed. (Had it been my lead that bolt would have been clipped fast as all hell). Completing the very airy, run-out traverse to the cramped belay, semi-hanging, Owen soon had us both struggling up behind him, with me whisked off the first rooflet by a mossy foothold, and feeling the pump through the second. The delightful P2 was dispatched soon after, Owen tagging the clean lead, and shortly after that we'd all rapped down, hiked out and returned to the tranquil surrounds of the camp for a late 3pm lunch. Above Right: Rapping off Maharajah (17). Below Far Left: Owen leading Beowulf (18) approaches the stuck cam, see video below. Below Left: Michael top roping Fat Wall Ordinaire Banana Blasé (16), Southwall. A well earned swim followed before the issue of what to climb in the couple of hours left before dark was resolved with a visit to the nearby Chadwel Galleries where we found Kent, James, Jono and others ascending the short bolted slab routes. Owen again made us proud with a run up a 19 who's name escapes me at present, but which I found very thin towards the top. I humbly picked my way up the rounded arête of Son Of Epic (16) for my lead before we all headed back to camp and the usual massive pasta cook up. The morning dawned with yet another bright sunny day, so we headed to the south wall near the Chalet with Beowulf (18) our intended goal. What a great route! Short, but very enjoyable. Owen cruised up the lead, while I shot some video from above. Making the steep, tips only layback moves look easy he ran out the final moves rather than placing mid-crux. A bold finish to a fantastic line. Brad and I got up in good style with the rope above us, and everyone had a go at freeing another stuck cam that had marked the crux when we arrived. 3 lobes of movement and only 1 over-cammed, a promising find. Kent attacked it for near on 15 minutes, but to no avail. We ate in luxury at the Chalet for lunch, our scabby hands and sweat soaked bodies drawing the occasional look from fellow diners, before throwing a top rope over the ever popular and interestingly named Fat Wall Ordinaire Banana Blasé (16), to the usual crowd of gawking tourists. I think I could climb this route on every trip and never get bored of it. Before lethargy truly set in, we made the decision make one more solid tick, and drove out to the Horn, rapping down Peroxide Blonde. I'd already lead it a few years ago, and could recall the thin moves, so gratefully handed the lead to our rope-gun Owen. Needless to say he floated up it with such panache that in contrast my cursing, grunting and moans of "man this is thin! ", were very appreciated by the awed onlookers in their city finery, as I came up third, the rope well and truly taught above me. Above: Owen leading Peroxide Blonde (20). Below Right: Michael leading This Is Not Our Land (19), Dreamworld. See video below. Calling it a day we headed back to camp, catching sight of Rod (A5iswhereitsat) and friends halfway up Maharajah (17) on the Cathedral and planning to bivi a top it purely for the fun. Madness! Still it is an extraordinarily beautiful location. Another quick swim and another big pasta cook up before bed, saw our third day of sunny weather roll around. This time we knew we wanted something short and sweet before heading home, and so made our way to Dreamworld back at the Horn. It was my lead, so I cast an eye over Buffalo Soldier (16), lured by the claims of "good protection" in the guide. Bugger that for a game of soldiers, buffalo or not! Said protection consisted of a pseudo-protectable hollow flake, maybe one RP, loosely slung thin jugs, and maybe one good nut at 3/4er height - not enough for my liking. Instead I chose the merrily safe This Is Not Our Land (19) with it's shinny metal. Launching up the super cool, and way fun solid jugs I placed natural gear between bolts one and two, before hitting the crux above bolt three. Leaning right I side-pulled on an adjacent feature, stepped up and side-pulled again this time high and with the left, leaving me braced between opposing holds. With the bolt at my feet the nerves started to tingle, and with a cry of "watch me" I carefully selected a thumbnail edge for my left foot, weighted it and crossed over with my right hand to tag a minor crimp inline with my body. The right foot now flagging, I pulled through slapping the super jug finish with a resounding "Ha!". What a hoot of a climb! Surely not 19, maybe 18, given the glorious jug hauling below. The problematic belay (being a good distance away and at a right angle from the top-out) kept my attention focused while the others came up and likewise declared the route one of the best at Buffalo for short and fun. 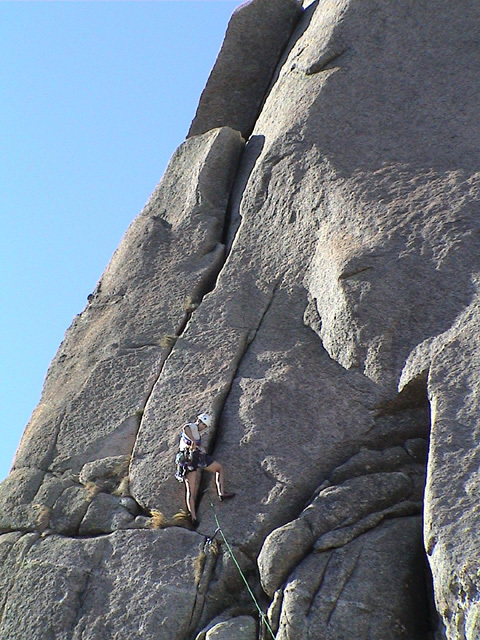 We threw the rope over the 16 and nearby 18 for a little top rope jug linking fun, with several shouts of "dyno!" from those below to encourage "last route of the trip" abandon. A quick lunch, a farewell to Owen, and a long drive home found us back in the land of the mundane. All up a great trip, possibly one of the best yet. Thanks guys! 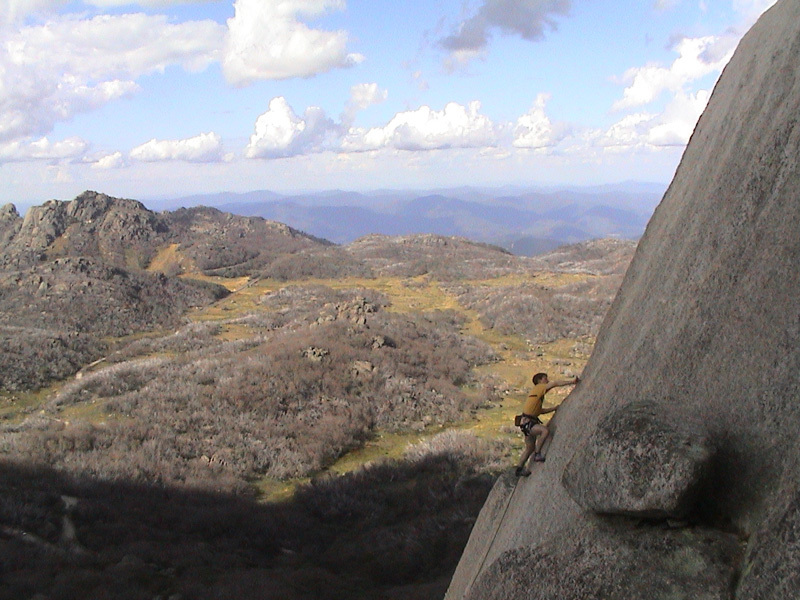 Owen leading Beowulf (18), South side of The Gorge, Mt Buffalo. This delightful tips only layback is awesome trad climbing. With a bomber rest mid-way and good gear it's a short route, well recommended. Footage shot from above. 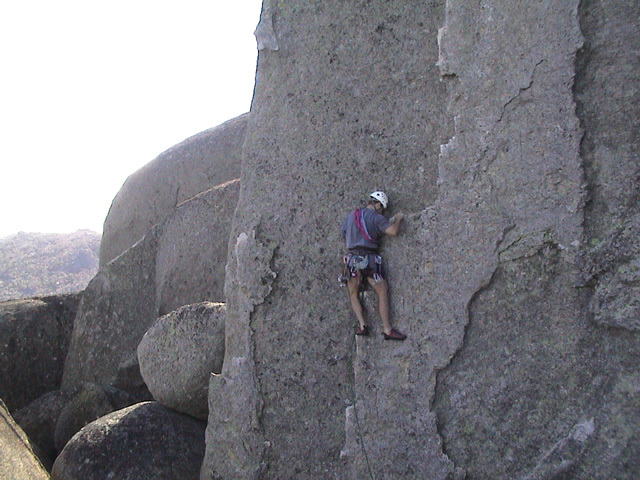 Owen leading Peroxide Blonde (20), The Horn, Mt Buffalo. 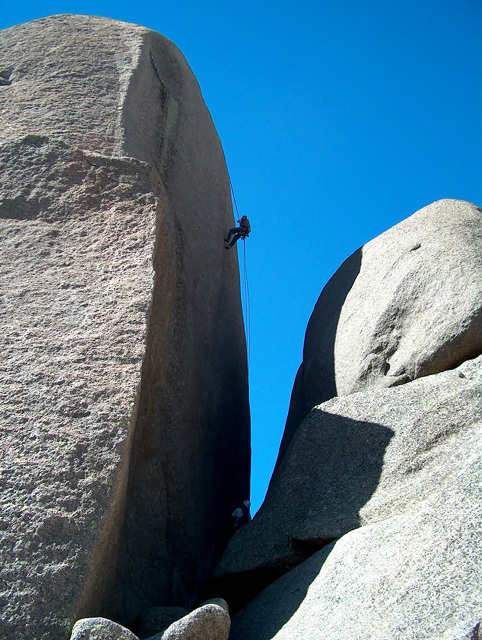 Thin slabbing along a sharp arête, that drops away on the left leaving the climber slide pulling with delicate smears. Bolted all the way and with an amazing backdrop, this is one of the mounts more popular short routes. 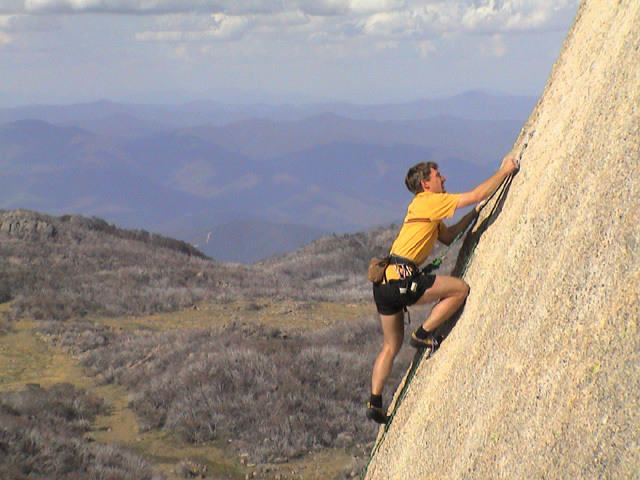 Michael leading This Is Not Our Land (19), Dreamworld, Horn Area, Mt Buffalo. Glorious jug hauling bar two small cruxes, the last and hardest just shy of the top out, this is one well bolted short, but sweet climb.